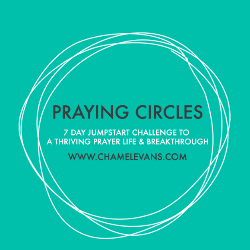 7 DAY EMAIL CHALLENGE TO A THRIVING PRAYER LIFE & BREAKTHROUGH! Hey Friend - It's time to PRAY! The PRAYING CIRCLES CHALLENGE is all about helping you surrender to God with full obedience as you learn to circle your life in prayer while God does the work. After you join above, you will receive an email with instructions on how to download your workbook. Get it printed and have your bible, pens, and high lighters ready as the challenge will ignite your faith journey. I'm looking forward to praying circles and watching God move. If you have any questions or concerns, please feel free to email me at any time. Thanks again for journeying with me. Your welcome email is on its way. Looking forward to praying circles with you!